December 6th, Holiday Challenge Party Advice – What's for dinner, Doc? Challenge: Enjoy the party, but plan your attack. The holidays are rich with parties, potlucks, open houses, and celebrations. By all means put on your best party dress and rock every party. Here are a few ideas to help you keep your fitness goals on track. 1) Wear a figure hugging fabulous outfit. You won’t want to overeat and be uncomfortable. Wear Spanx not elastic waist expando pants. 2) Bring a dish that meets your dietary goals. Fancy crudités and a lowfat Greek yogurt caramelized onion dip, perhaps? 3) Plan your attack. Which choices are special, “once a year, not to be missed, totally worth the calories” dishes? Have a scoop of your favorites. Fill a salad plate with the “best of the best” foods and then …. 4) Walk away from the food and turn your back on the buffet table. 5) Start a conversation with someone interesting or be that someone interesting. Smile, everyone will notice your sparkle. 1 onion, you will have leftover caramelized onions. Thinly slice onion and sautée in a dash of olive oil until golden and caramelized. About 20 minutes. Combine yogurt and cheese in a food processor until creamy. Stir in onions, pepper, and seasonings. Adjust seasonings. Serve immediately with crudités or let sit overnight in the refrigerator to allow flavors to mingle. 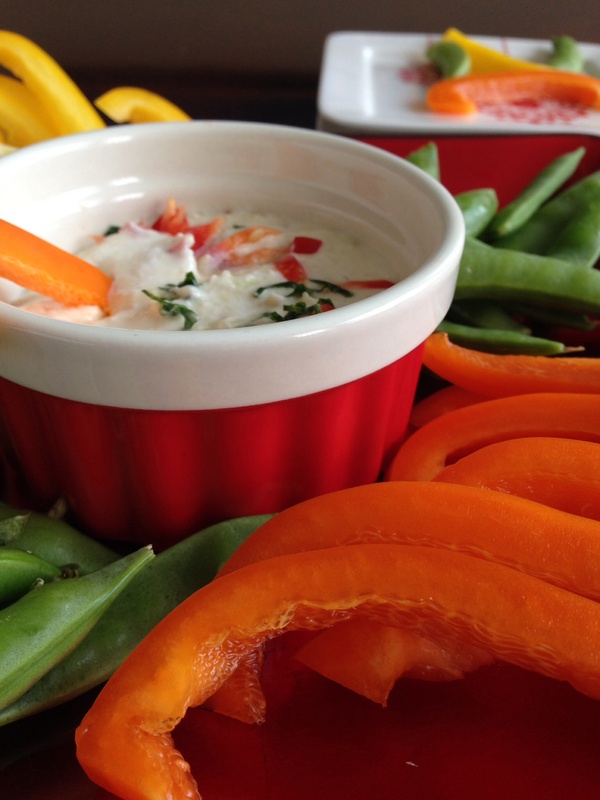 Serving suggestion: Serve with colorful cut vegetables; pepper slices, snap peas, carrot sticks, for a lowfat protein packed snack or appetizer. Previous Post Shop ’til you drop …… and give me 10! I’m a fan of anything with caramelized onions in it. I’m also a fan of choosing the best indulgence, having a little, but sticking to the healthy nutrient dense stuff the rest of the time. It’s all about balance. I’m glad you agree Meghan. Wellness is all about balance. This dip sounds delicious. You delivered some really good ideas for helping us with over indulging.